Downtown is not for the faint of Art. I am physically exhausted, my shoulders are tense and my legs hurt and my eyes- oh my eyes! They feel like they’re going to weld themselves shut at any moment. Oh, and I have this big, dumb grin on my face that just. Won’t. Stop. But why am I so ready to collapse? Art is one of those super-charged words. It can hold so many ideas, concepts and misconceptions all in one short little three letter word. Art can hit people in different ways. What may appeal to one looks like a mess to another, and that’s what makes it so special. Art is a personal experience. You don’t need me to tell you this- you’ve looked at art before. My favorite part of my job is that I somehow became the supreme queen of tours– a title I’ll only give up with a great amount of kicking and screaming. This puts me on a first name basis with the art in our district. It allows me to sometimes get lost in the textures and colors of the public art when I’m out along the mall running a completely unrelated errand. I still have a lot to learn, which is another thing about art. It’s hard to ever know all of it’s secrets. That’s what keeps people coming back for more. It’s why I don’t really feel bad when I repeat material on Yellow Umbrella Tours. You can never ever possibly know everything about any one single piece of art, no matter how many times you ponder it, photograph it and even, yes, touch it. For two days in a row I have had the ultimate honor- I’ve been sharing our public art collection with school groups. Yesterday I had the pleasure of working with eigth grade history students. They had the best downtown day ever all planned into one field trip- Ice Skating, CartHop, an art walk, a tour of Chukchansi Park and a silent film at Warnor’s. We like to tailor the presentations we give to the schools’ needs, so this one was mostly focused on the history and more importantly- the future of Downtown Fresno. Alongside my super rad colleague Steve Skibbie, I was able to be on the “A” side of a Q and A with the 150 bright and well informed students about the Fulton Mall options while sitting in the Banker’s Ballroom of the Pacific Southwest Building. It was inspiring- I knew after talking to these young people who were asking smart questions and were better informed about the issues at hand than most adults, that our city is going to be in good hands. Today I had another school group- this a group of 91 sixth graders from Kerman. Let me say that again. 91-very-excited-bright-and-very-loud-sixth-graders. This group was here for an art tour, so I created handouts with fill-in components and a hands-on art project for after we’d spent the morning looking at art. So let me share this- until this morning I thought that I was only giving my tour to 70 kids. This morning I checked my e-mail and discovered it was 91 kids! After momentary panic, I ran to Harbor Freight, bought a megaphone and breathed to myself “you’ve got this.” Even though yesterday we worked with 150 students, they were broken up in groups so I didn’t have to command the attention of that many youth. Today was by far the largest group I’ve ever take on a tour at once. And it was awesome. There is nothing quite like the excitement of almost 100 kids all recognizing that the Clay Pipes by Stan Bitters at one end of the mall are the same as the ones at the other end- and before I even had a chance to point it out. One boy would loudly proclaim “MOSAICS!” as we would pass the many mosaic benches created by Joyce Aiken and Jean Ray Laury. They oooh-ed and aaahhhh-ed when we’d pause, our group taking the entire midsection of the mall, to look up and notice the details of the Helm, Pacific Southwest, Bank of Italy, TW Patterson, Brix, Kress, Mason and more. After all- the architecture in our beautiful downtown buildings is art, too. I’d ask them “What do you see here” at Orion, Valley Landing and Talos and I’d get responses like “A Taco!” “Sharks!” “A Rubix Cube!” “Spiders and Birds!”- each one with exactly that punctuation- there is no hum-drum middle ground here. These kids were into it. We’d paused in Kern Plaza to talk seriously about vandalism as I perched in front of the three pools where the art of Claire Falkenstein is notably missing. 91 kids in somber unison agreed to respect art and pass it along to their friends that vandalism of public art affects everyone. After a lunch break, we had a reflection time. Okay, so the word reflection is a little bit too serene for what happened here. I pulled out the art supplies and every student thought about the art they’d experienced and drew the pieces they liked the most and- because art is subjective, which ones they had a hard time connecting with. Among the favorites were The Visit, Obos and Mother and Child. When it came to the pieces they were not-so-hot on I was blown away. Almost all of them drew pictures of the 3 pools where the 3 Fires exhibit was taken off display. The severity of public art being vandalized and removed to protect it from criminal elements hit home for them all. I wasn’t expecting that and it overwhelmed me. When those pieces were found to have been vandalized earlier this year I took it as a personal blow- they were some of my favorites. The final portion of the day was to create new art for the Fulton Mall. Not many new pieces have been added- the Yokuts Indian was installed 10 years after the mall’s opening but there hasn’t been much change since. I asked them to imagine what they’d like to see along the mall and chalk it in. And they did, oh boy they did. Sprawling happy faces, scenes of families, flags and even a dance floor were added to our already impressive and diverse art collection. It was pretty cool and if I wasn’t worried that I might ruin our Graffiti Abatement team’s day, I’d totally go spray over it with a clear protective coat. Unfortunately, that’s not my decision to make- this corridor belongs to all of us and none of us all at once. As the semi-self-appointed art guide of the Fulton Corridor, sharing our art with students is a huge joy but it’s also kind of a tough task. Our collection is ridiculously undervalued by the community considering it’s ridiculous value. You can pass by a piece without even seeing it and the informational plaques are small, vague and hard to find. They only state the name of the piece, artist and year, but other interesting details such as materials, inspiration and artist history are lacking. Some pieces don’t even have them. Pieces are subject to vandalism because the added security of eyes on the street just aren’t there. There is no street. Despite all of our best intentions to bring attention to them, educate people and introduce them to our art we can’t do everything and once the businesses close their doors and office workers head home this place is quiet. Until this space is conducive to a protected and respected art environment with more people around after dark, they’re susceptible to vandalism. Obos has graffiti on one of it’s orbs that can only be removed by an art specialist, so when a child asks about it on a tour all I can say is “It will be taken care of, hopefully soon.” Art is expensive to maintain, but how do you tell that to an idealistic 12 year old? How do you explain that your non-profit’s budget is already stretched fairly thin? You don’t. You just reiterate that it is of utmost importance that their generation understand how to respect art. You say the artist’s name again until it sticks in their head and you keep your fingers crossed that when the time for change comes it will be done mindfully and with attention paid to facts, data and what works in other cities. This art will not survive another 50 years in the mall if no change comes. And this is why I do this. This is why DFP keeps art tours on the menu. 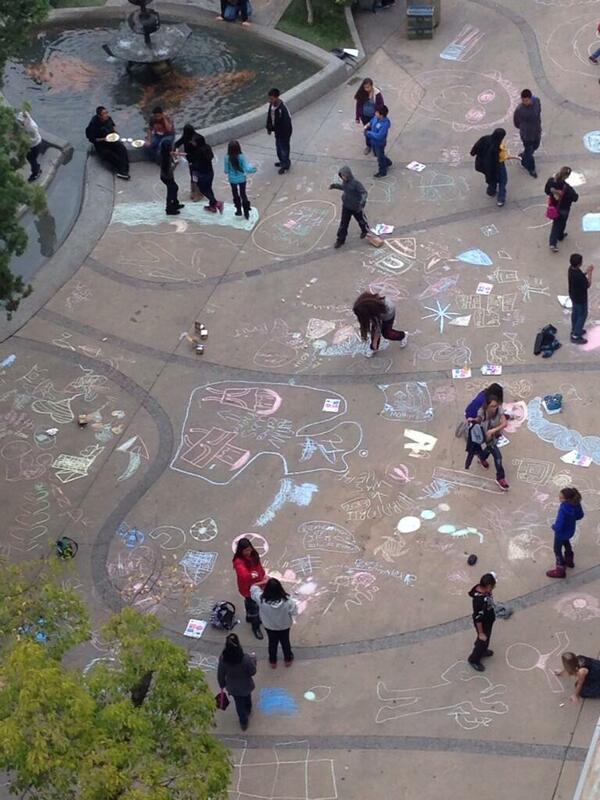 It may seem like it’s a bunch of fun and games- I mean, what’s not fun about a hundred kids putting chalk art along the mall?- but the reason we prioritize art education is to make sure people know what we have here. We can’t do everything, but gosh- what if everyone did something? What if everyone knew all of the factors at play and could participate in creating a space where our art collection is revered? Tour groups are just one way of engaging the public- and the public are the people that Public Art serves best. And now my “Follow me- I’m right here” arm is sore, my voice is shot and darn-it- my face is still in an uncomfortably big smile. I gave every bit of energy I had for two days and the exhaustion is 100% worth it. If you’d like to take your school group or youth group on an art tour, let us know. We’re always honored to share what we know. If you have any information about any of the art pieces that we haven’t already shared on our website, let us know. We want everyone to be able to hear about this amazing art.